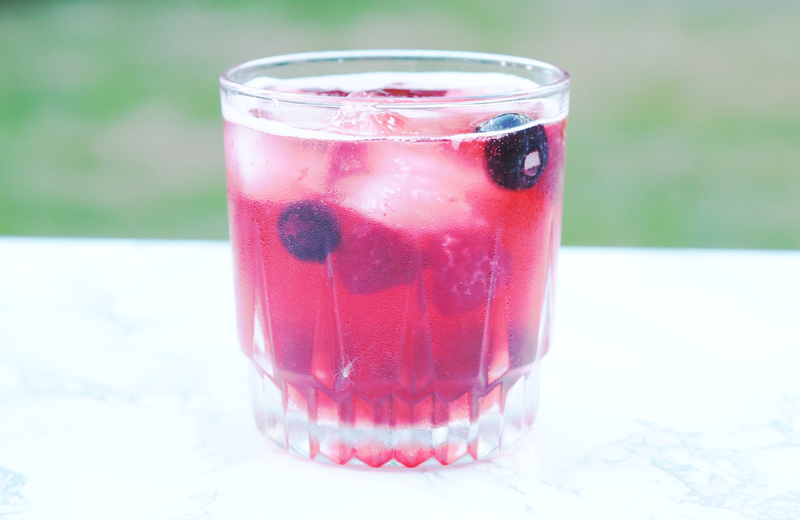 Cider has become my favoured drink as it's easy drinking and packed full of flavour. Having a cool fruity drink is perfect for the summer months so I was excited when Cranes asked if I'd like to test out some of their ciders. Cranes Cranberry Cider are brewed by founders and twin brothers Ben and Dan. After finishing university, they reunited and formed the brand Cranes. Eight months later with a lot of hard work, their recipe was finally finished and ready for production. The brand name came from the twins dad doing a little research to find out that Cranberries used to be called 'Crane-berries'. Creating the cider comes from brewing the finest cranberries with apples to make the refreshing naturally light cider that comes in three different flavours: Cranberry & Lime, Blueberry & Apple, and Raspberry & Pomegranate. 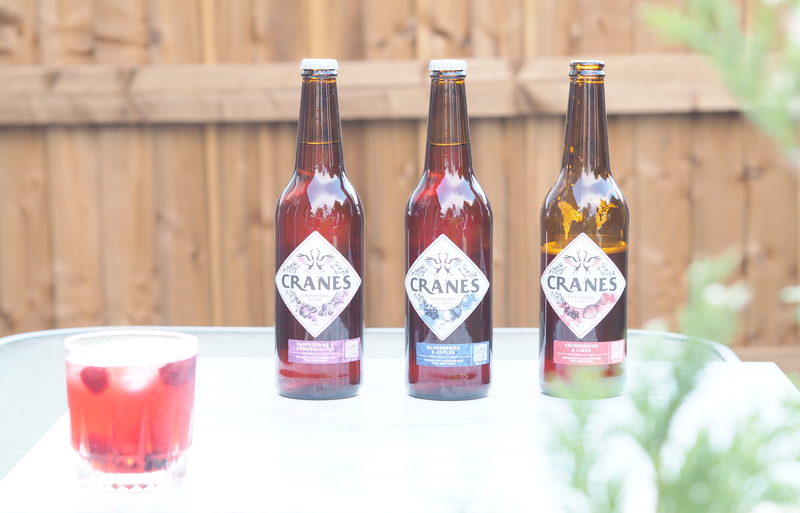 Cranes Ciders have 30% fewer calories compared to brand leaders, which is made possible by utilising the sweetness of the fruit without being full of sugar. If you fancy picking up your own ciders, you can head over to the Cranes website where you can get a 12 pack of 500ml bottles for £27.60. Seen as we've had some lovely weather over the bank holiday, it only seemed right to head out in the sun and set up a BBQ. Having the Cranes Ciders cooling in the fridge meant that they were the perfect accompaniment to the rounds of burgers and chicken. I found them to be a lighter taste than other ciders I've had before which meant they were super refreshing and worked really at the BBQ. Each of the ciders are variations of cranberry cider and all have their own attributes, with some being slightly sweeter than the others. 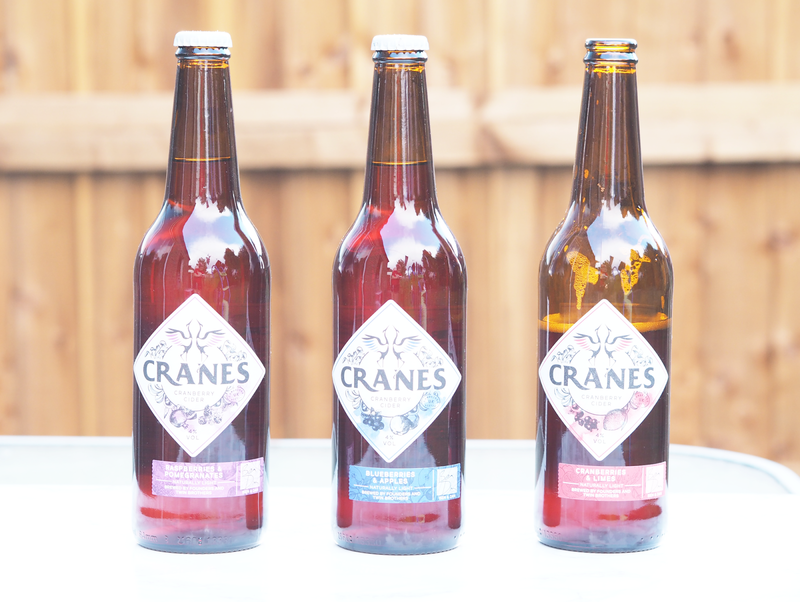 If you enjoy fruity ciders, then I would definitely recommend giving some of the Cranes Ciders a try! It's that time of year when many people are waiting for their exam results and will be keen to find out where they're heading off to university. I can't believe it's five years since I was in that position, it seems to have absolutely flown by. I had the pleasure of attending Northumbria Uni, in Newcastle, studying Geography BSc (Hons) for three years until I graduated back in 2015. Even though it's been a couple of years since I finished, I still feel like I've only just left. Different universities will often have a dedicated clearing web page, such as the Northumbria University Clearing Page and a clearing app that you can use to keep up to date in the run up to, and on results day. To download Northumbria's clearing app, just search 'Clearing Guide 2017' in the App Store. Personally, I found that being at uni was one of the best life experiences I could have as it put me in a more independent position where I had to 'fend for myself'' as it were. Having time to reflect on my time there has been good, as when I look back now I realise I managed to grow as a person and gained so many useful skills that I now use in my graduate role. 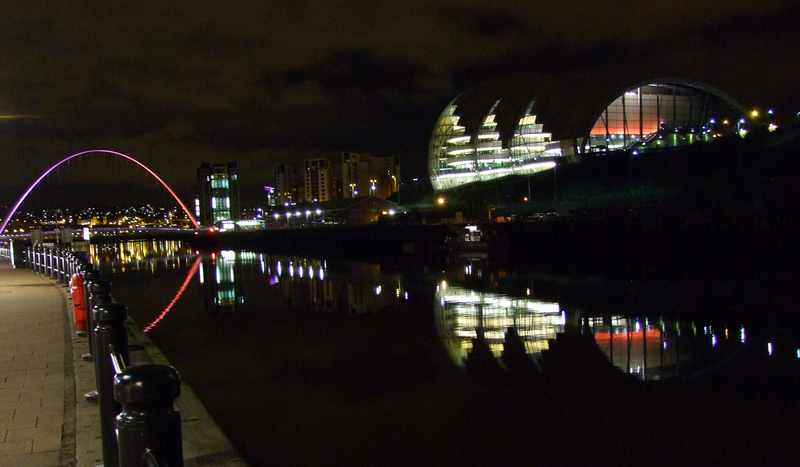 Northumbria University is based in the heart of Newcastle which I found to be great for going into the city centre. My course had a mix of lectures, seminars, tutorials and practical based sessions. I found the content really interesting and the different assignments actually helped me to learn key knowledge and skills. There were a number of field trips as part of this course ranging from a weekend in Berwick Upon Tweed, in Northumberland, to a week in Tenerife. I found the uni gym super handy as it was located next to all of the other buildings so I could go in-between lectures. It's worth checking out as they have loads of equipment and a range of membership options to suit different needs and budgets. For accommodation, I opted for Glenamara House which was a 7-room flat with two communal bathrooms, sinks in each room, and a communal kitchen. This was a good middle ground between price and location and was perfect for the first year with new flatmates. Like all the uni's accommodation, it's within walking distance of the campus and they guarantee all new students accommodation, including those going through Clearing. 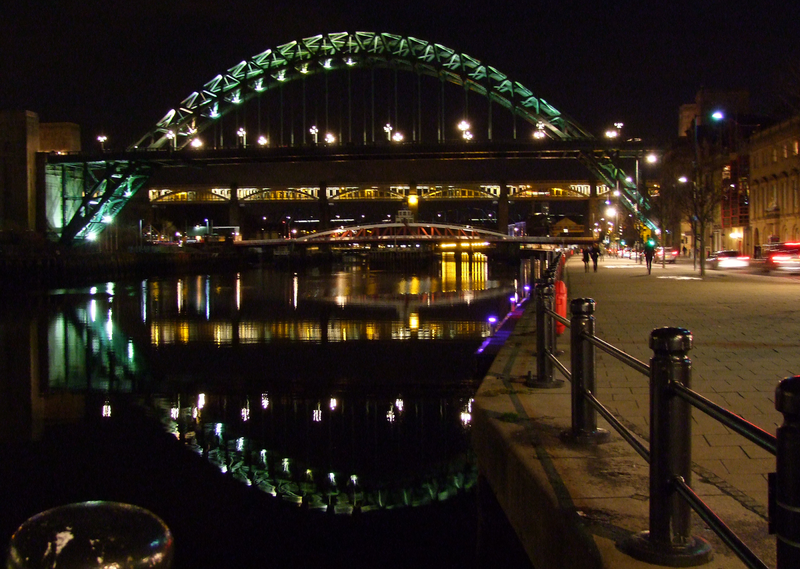 Newcastle is known for having great nightlife as there are so many venues and events, you should never be short of choice for a night out. 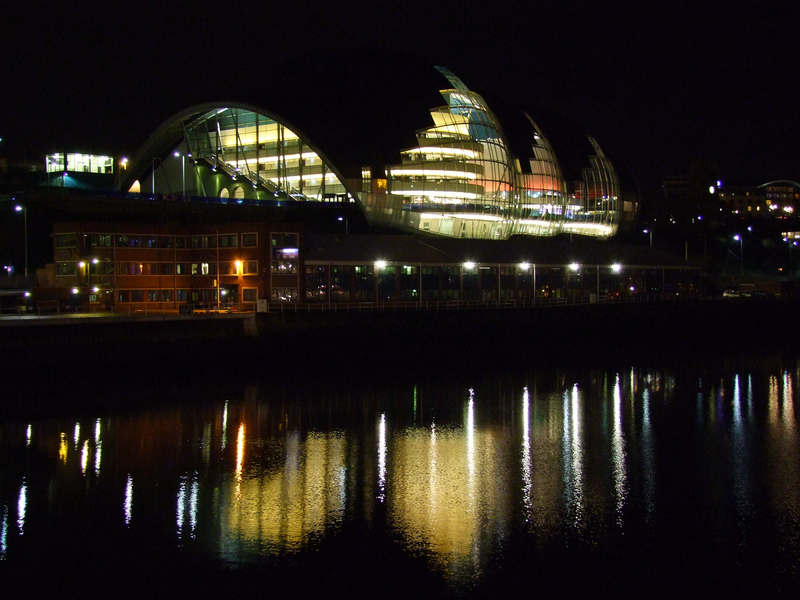 If you fancy exploring the city at other times of day it's worth heading down to the quayside as it has some nice views and looks particularly photogenic at night as you can see above. If you think you could see yourself at Northumbria University, this info below should help you understand the everything about clearing. 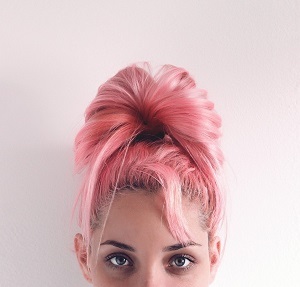 You don't hold any offers, either firm or insurance, from your initial UCAS applications. You applied after 30th June. You do not have a confirmed place from your firm or insurance course. If you have only made a single choice on your original application, you can pay £11 to apply to other uni's through clearing. A Clearing Number will automatically be given to you by UCAS if you are eligible, just use your UCAS Track account. If you are worried about getting a place to live when going through clearing then don't worry, Northumbria Uni will guarantee you accommodation for all first-year students. They have over 5000 bedrooms in a mix of residence types including both budget friendly and en suite options which are all nice and close to the campus. The uni works with referral partners to make sure every student that comes through clearing will have a somewhere to live arranged for them. You must call up yourself, unfortunately, it can't be your friends or family ringing on your behalf. Have your UCAS personal ID number and Clearing number to hand. Know the UCAS code and title for the course you want to apply for. Have your qualification details ready, including your GCSE's and others. Be prepared to talk to the admissions tutor about why you are choosing your course. Have a pen and paper by your side to write down any important details. Have some questions that you may want to ask to help you make the decision. I hope that this post has made it a bit easier to understand the process around clearing and made you think about checking out the options for Northumbria Uni. I've done a few other posts in my Uni Series which could be useful for those of you either thinking about or already in uni. Good luck to those of you getting your results on Thursday! 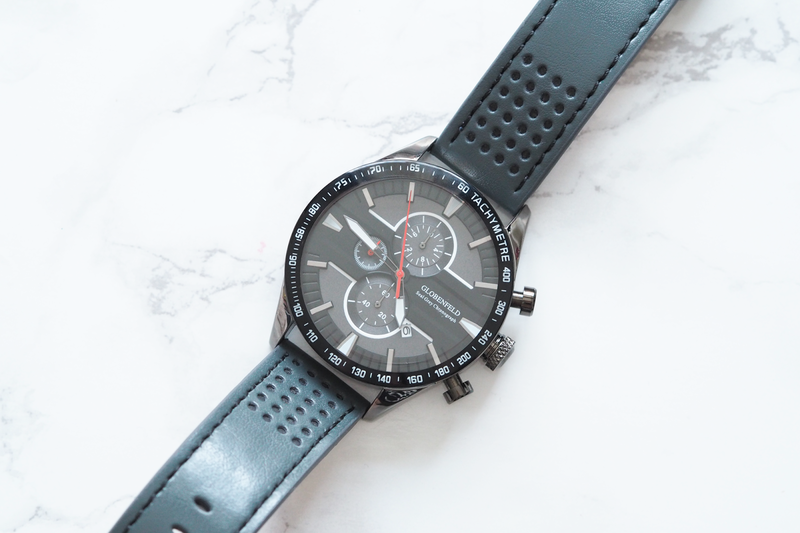 The Globenfeld Seal Grey Chronograph Watch is priced at £149.00 and has an understated modern design which will be a great addition to any outfit. The first thing I noticed when I opened the box was the width of the face which, at 46mm, is on the larger size. It's great for someone like me who has a large wrist and prefers a bigger watch. Weighing in at 77 grams, it's got a solid feel to it without being too cumbersome. I love the combination of jet black and grey face with the tachymetre outer ring in black and silver. A date window integrated into the face makes for easy viewing, while the white hands stand out nicely which is finished off with the distinctive red second hand. A stopwatch with 3 dials gives you an option to accurately capture timings. All of this is protected by the scratch resistant glass that should withstand prolonged use. Being contained in this neat watch box makes it perfect if you were giving it as a gift or even for those who like to keep their watches stored safely when not in use. 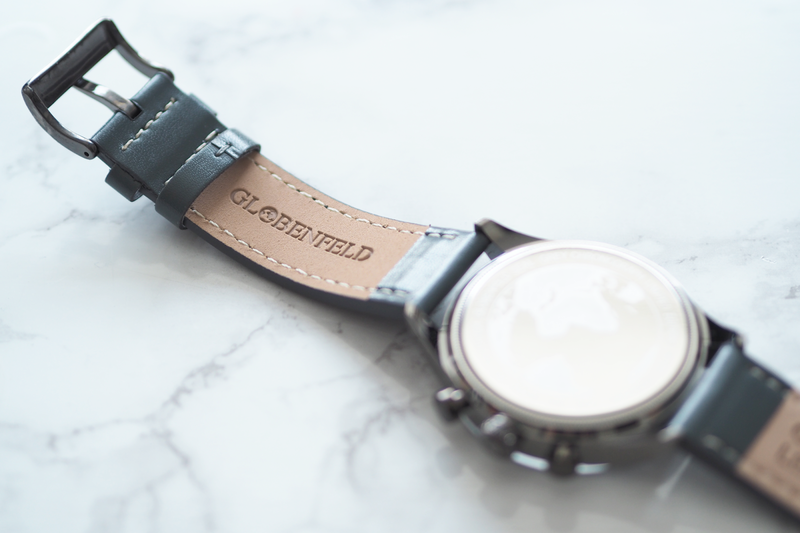 It has two magnetic closures that open up to reveal the watch in its padded presentation box. The crowns and textured bezel are a good size and easy to operate and match the solid build of the watch. 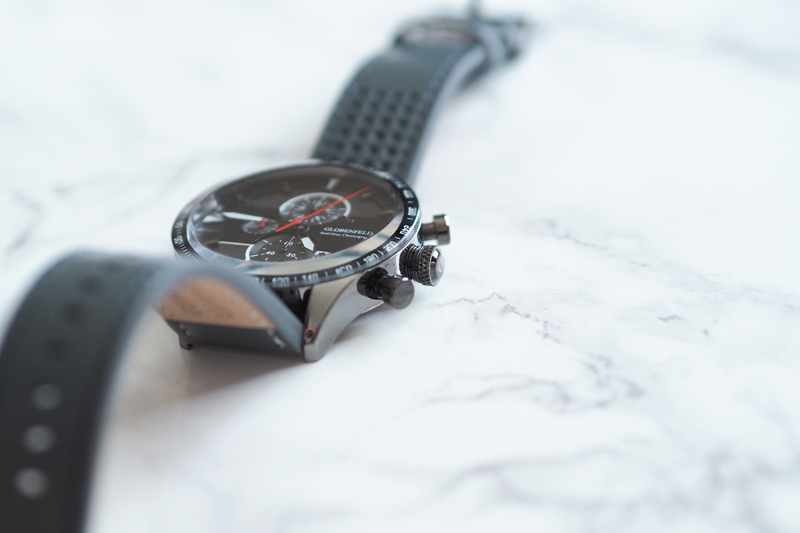 The leather strap is 22mm in width and sits nicely on your wrist to ensure it's comfortable, while still giving the watch the finishing touch of class. 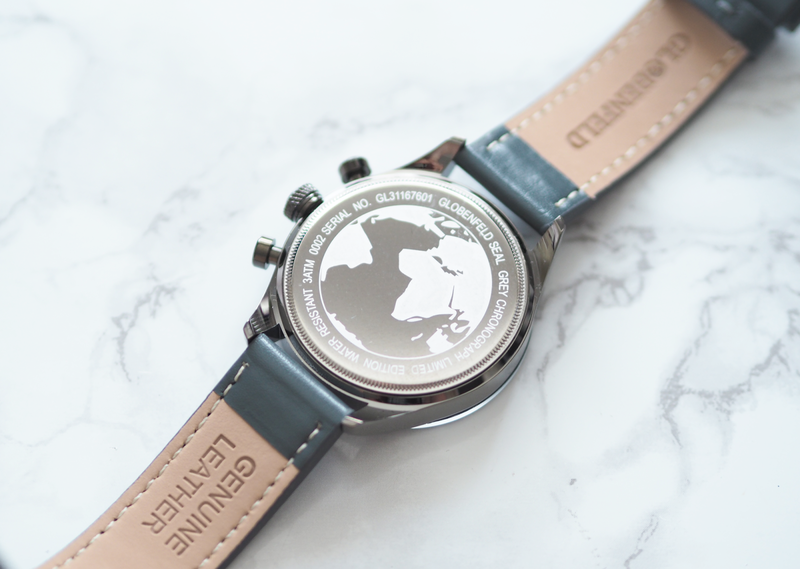 I think my favourite part about the rear of the watch is their logo on the silver plate which gives it a completely unique look. White stitching along the inside of the strap works well with the tan colour. 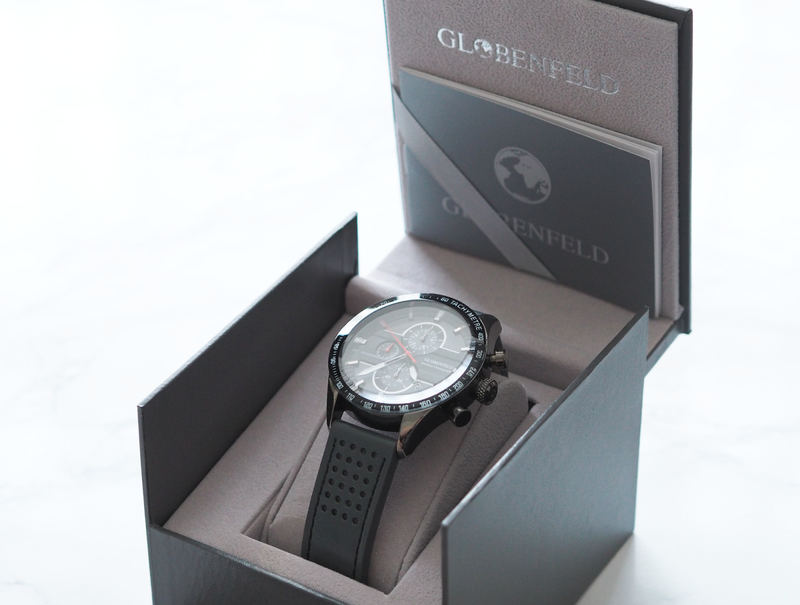 This watch could be worn in different situations, whether you want it for sports use to make use of the timing function, a more formal option for the smarter looks or even to complement a casual outfit, the Globenfeld Chronograph would be great for any of these. I can definitely see myself wearing it at work with a shirt and tie as I think it will be a nice addition to my outfit. 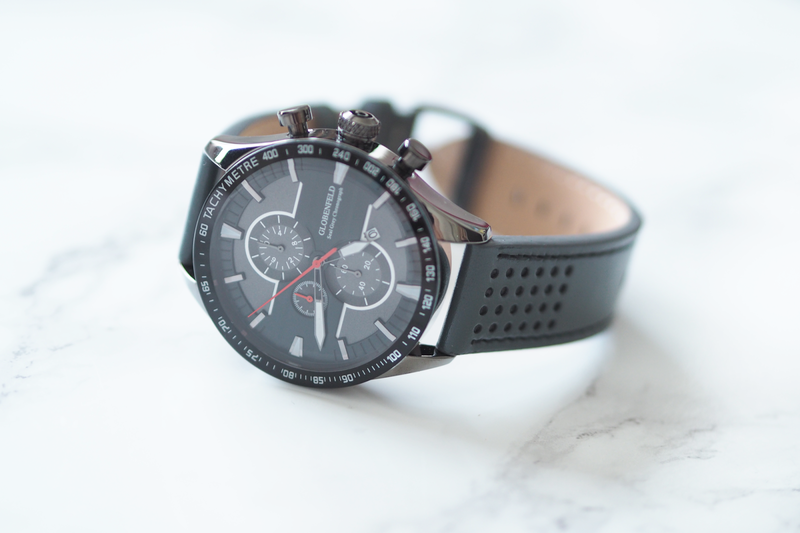 I'd say the watch is fairly well priced for its features and looks and could be suitable for anyone looking for their first watch or one to add to their collection.